University of Michigan Flint Campus retained DPCI to implement EnterMedia, an open-source digital asset management system, integrated with Drupal via the EMBridge module, to provide enhanced digital asset upload, search, and retrieval functionality to stakeholders throughout the UM-Flint community. Founded in 1956 on a commitment to bring a quality Michigan education to Flint and the surrounding area, University of Michigan – Flint is a public university and is one of the two University of Michigan satellite campuses. When UM-Flint came to DPCI, the University Relations department was using a proprietary digital asset management (DAM) system to store and manage tens of thousands of media files. UM-Flint staff was dissatisfied with the functionality and implementation of the DAM system as well as the software's annual cost. UM-Flint also wanted to revamp its metadata schema to better categorize image files so that they were easier to find and reuse. In addition, the University website, built on top of Drupal CMS, had no connection to this DAM to access images for publishing on the website. The UM-Flint University Relations department considered adopting an open source digital asset management system that would not only reduce software and maintenance costs, but would enable the integration with Drupal for management, reuse, and transformation of digital assets. DPCI recommended EnterMedia, an open-source digital asset management system, integrated with Drupal via the EMBridge module to provide enhanced digital asset upload, search, and retrieval functionality for the various constituents comprising the UM-Flint campus community. DPCI provided digital asset management consulting services to design a solution that would meet the specific needs of UM-Flint's University Relations team. DPCI started with a review of the existing DAM as a guideline, and then collaborated with staff to establish the implementation requirements for EnterMedia, including permissions, metadata, asset transformations, and workflow. 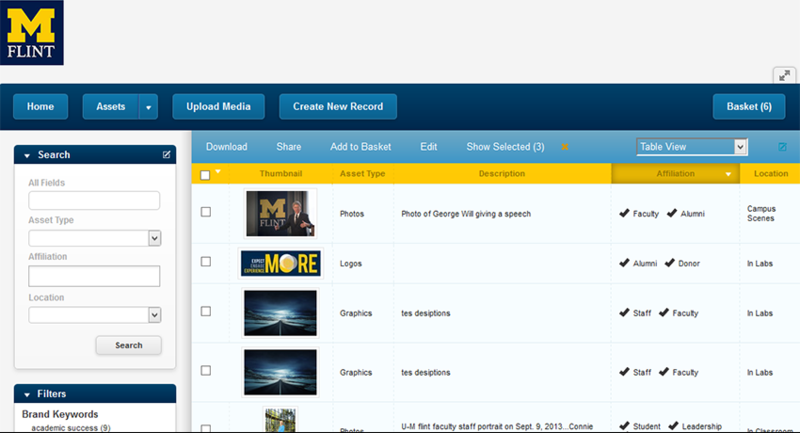 DPCI installed and configured EnterMedia version 8 to store all of UM-Flint image assets. DPCI then implemented EMBridge, a Drupal module maintained by DPCI that provides advanced image management capabilities to Drupal by connecting to EnterMedia. DPCI extended the functionality of EMBridge to meet UM-Flint specific requirements including enhancements to the search results display, enforcing restrictions for image upload, and support for inline images in Drupal's rich text editor. DPCI also created image transformation presets so that EnterMedia would generate the necessary asset renditions on-the-fly for delivery to various pages of the Website. By using EMBridge, Drupal users have access to all of the features and benefits of the EnterMedia including asset metadata, thumbnails, and automated image transformations, without ever leaving the Drupal content creation interface. Drupal references the assets stored in EnterMedia, allowing UM-Flint to maintain a single source of truth digital asset archive that can be utilized by other systems and applications in the future. In addition to EnterMedia and the Drupal connection via EMBridge, DPCI also assisted UM-Flint at the other end of the Digital Asset Management workflow – asset ingestion. 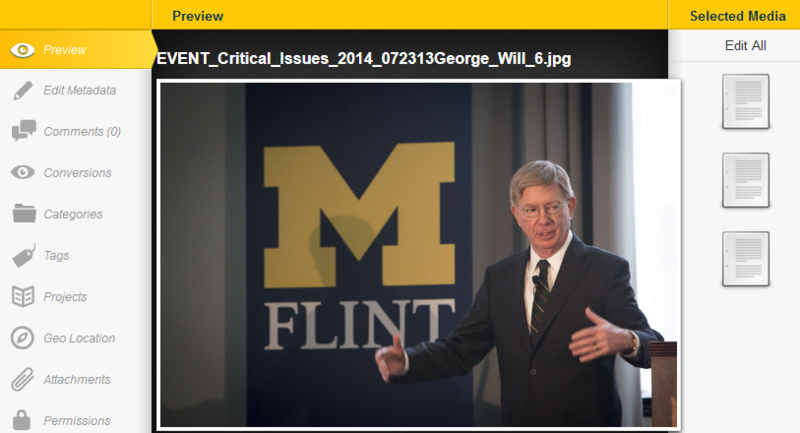 By creating an Adobe Bridge Custom XMP File Info panel, it enabled UM-Flint University Relations staff to quick review and add metadata to assets prior to their upload into EnterMedia. This ensures the proper vetting of images and the addition of comprehensive metadata before upload so the proper assets are guaranteed to be easily found. With the help of DPCI, the UM-Flint University Relations department has now transitioned to an open-source digital asset management solution that saves them time and money while also providing a scalable platform to handle the growing volume of digital assets managed by the University. 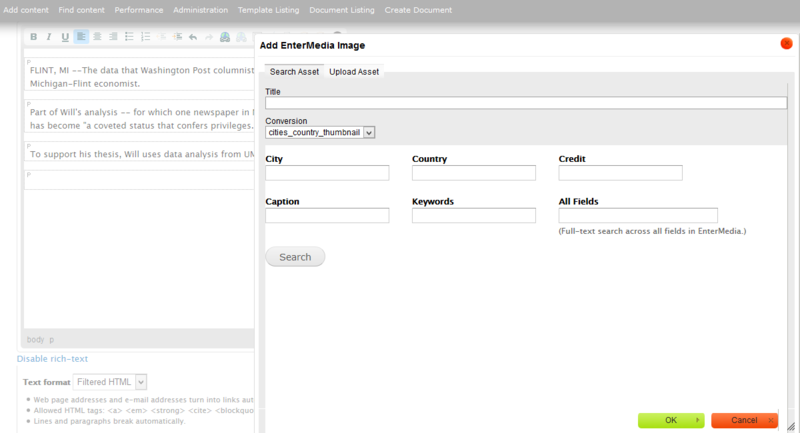 The EMBridge module also helps to reduce work effort for the Web team by allowing content editors to stay right within Drupal's content creation interface to upload, enrich, search and retrieve image files from EnterMedia for publishing online.